It's my turn to host Project Pastry Queen again, and I've noticed a pattern. Every single one of my recipe choices has been a fruit-based treat. For a self-proclaimed chocoholic, I am actually a bit surprised by that! Though I'll be honest: this time I was thisclose to choosing a cake with Jack Daniels icing, since I knew my week landed on Father's Day and Joey loves Jack. However, I decided to be selfish, since I wouldn't have been able to eat a cake that frosted with whiskey. Plus, peaches are coming into season here, and what kind of Georgia-girl would I be if I don't choose peaches?? This peach cobbler is nothing fancy or complicated - just a really basic dessert. The kind you'll find at a church picnic or your grandmother's house. Fresh, sweet peaches with a doughy and buttery crust. You'll want to serve this warm, with vanilla ice cream; though I did eat my fair share straight from the dish, and it still tasted pretty fantastic. I stayed pretty true to the recipe, but I added a bit of cinnamon to the peaches to give them a little warmth and bring out more sweetness. I started to make these into individual cobblers, but in the end decided to stay rustic and family-style. I hope all the dads out there have a happy Father's Day! See how everyone else liked this cobbler, and check back next week - we're baking up muffins that use an entire lemon! Melt the butter in a small saute pan set over medium-high heat until it bubbles and turns a nutty-brown color. Watch it carefully to prevent it from burning. Pour the butter into an 8-inch square baking dish. In a medium bowl, stir together the granulated sugar, flour, baking powder, salt, and milk. Pour the mixture over the butter, but do not stir. Arrange the peaches evenly on top of the batter, and sprinkle with cinnamon and then the brown sugar. Bake the cobbler for 40-45 minutes, until the top is golden brown. Miraculously, the batter will migrate from the bottom of the pan to the top to cover the peach slices. Serve warm with vanilla ice cream, or at room temperature. Looks wonderful. I love peach cobbler. I will have to try this recipe later in the summer when peaches come into season here in NY. I'm so happy you went for another fruit dessert, because this looks amazing! Beautiful dessert! I love peach cobbler but I don't think the peaches in CA are that good yet...I'll have to wait a little longer before trying it. I'm so glad you posted this today - of all the things I was thinking of making for Father's day Peach cobbler kept jumping! Thanks! Love, love, love this recipe! It's my go-to cobbler. Thanks for picking such a great dessert! Oh my it's been a long time since I've had peaches in my desserts, this will have to change. This was such a great choice for PPQ this week, Josie - we totally loved it! I agree that it's such a basic dessert but the flavors are wonderful and a scoop of ice cream only makes it better. Thanks for choosing this one! 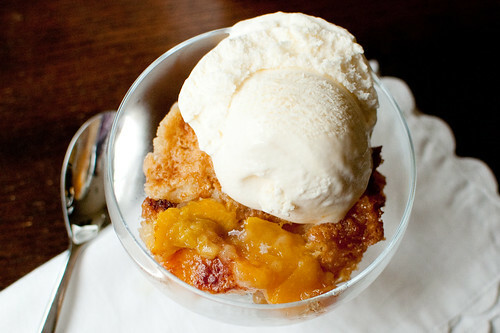 This is my first attempt at making cobbler... do you recommend peeling the peaches? Or leaving skins on? I peeled mine simply because that's the way I prefer them, but the recipe actually called for the skins to be left on - so it's your call! This was so easy and delicious! My husband preferred this version to my previous recipe (CI's biscuit topping cobbler). Thank you! Now I will need to check this book out of the library. This cobbler was ridiculously good. I ate the leftovers all week and it tasted even better with each passing day. I love when peaches are in season! This recipe looks great! Am I correct when I read it calls for 1tbsp of baking powder though? That seems like a lot! Yep, that's right - the baking powder helps the batter rise over the peaches to the top of the dish. Hope you enjoy! So yummy!! I used nectarines and added a 1/2 teaspoon vanilla paste. Will make again and again!! This was great - I added ginger, cloves, cinnamon and nutmeg to the batter and cut back on the brown sugar. Super yummy. Thanks for the reply, Josie! I finally got a chance to make the recipe today and it turned out beautifully. I added fresh local strawberries to it too- yum! I first made the recipe at the beginning of August; today will be the third time I make it for a party I am going to. Supposedly there are 20 people coming and I need to make two! I know my friends they just want leftovers. People love it so much I am now being called the "Cobbler Queen" along with a different blackberry cobbler I make. Thank you so much for the recipe...it rocks even when the peach crop was not the best this year in Texas. Made this with strawberries, thank you for this divine recipe! I can't wait to try it with all sorts of fruit! I tried this and could not get it to cook in the center, no matter how long in the oven :( I followed the instructions to a T, 8 x 8 pan and everything, I even adjusted the temperature to 400, and still could not get it to come out right. Now I just have a really doughy center and a really browned top crust. Perhaps this would've worked better in a 13 x 9 pan? Shannon, I'm not sure what happened. I've made this multiple times with no problems. The center is is supposed to be a bit soft and doughy though. Sorry it didn't work out for you! Can you use frozen peaches as well? This was really, really yummy! The first one I made was peach/blueberry. My boys gobbled it up very quickly and started pleading for more. The next one I made with some sour cherries... but my batter didn't rise to the top. Perhaps I had too much fruit? Joyful Ma, I'm not really sure. I would check the expiration date on your baking powder. It could be the amount of fruit or maybe the cherries were too heavy? Sorry!